Most patients today realize the importance of taking an active role in their health care. This includes understanding their disease or condition as well as deciding on an appropriate treatment plan. But many people never consider the importance of asking questions about the medications their doctor is prescribing. But being informed about the drugs you are taking is an important part of managing your health care. In fact, anytime your doctor writes a new prescription for you, you should ask a few questions before agreeing to take it. By doing so, you will not only better understand the medication you are taking and how to use it, but you also will learn why you need to take it and what to expect. When you ask questions about a new prescription, you are becoming an active participant in your health care. No one should ever blindly take a drug just because the doctor says to. Instead, decide together what is right for your situation. Here are the top six questions to ask your doctor the next time he suggests you take a certain pill or medication. While this may seem like a strange question to ask, it is probably the most important one you can ask. In fact, research suggests that more than 50 percent of prescriptions are either taken incorrectly or not at all. As a result, you need to know what will happen to your body if you decide not to follow the treatment plan or if you take the medication incorrectly. For example, if you have high blood pressure and do not take your medication, you are putting yourself at a greater risk for a heart attack. Meanwhile, if you stop taking your antibiotics once you start feeling better you run the risk of the infection returning or not going away completely. While there are some prescriptions where you can wait and see if you need to take the medication, there are others that need to be taken exactly as they were prescribed. Be sure you know what could potentially happen if you hold off on taking your prescription. Is Taking This Drug My Only Option? Sometimes taking a pill is not the only solution for your disease or condition. For instance, those with mild depression can sometimes benefit just as much from exercise as they can from taking an antidepressant. Meanwhile, some people with type 2 diabetes can reverse their condition by losing weight, increasing their activity, and reducing the number of carbs they eat. When your doctor offers to write a prescription, be sure you know if there are other options available to you. Making an informed decision about your condition requires that you gather information about all the options available to you. This way, you can choose a treatment plan that best fits your situation. What Are the Risks and Benefits of Taking This Drug? All medicines have benefits and risks. Be sure you know what the side effects are of the medication as well as any interactions this drug may have with your current medications and supplements. Ask for your doctor's help in determining whether the anticipated benefits outweigh any risks associated with this drug. It also is a good idea to ask about any warnings associated with the drug as well as the most common side effects. Some drugs have proven over time to have a lot of adverse or dangerous effects. When this is the case, the drug is given what is called a Black Box Warning. This type of warning appears on a prescription drug’s label and is designed to call attention to serious or life-threatening risks. A Black Box Warning is the strictest warning used by the FDA in labeling prescription drugs. It is used when there is reasonable evidence that there is a serious hazard associated with the drug such as serious injury or even death. As with any prescription, the risks versus the benefits should be weighed before taking the drug. Some medications, particularly antibiotics, cause allergic reactions in patients. If you are someone who has had an allergic reaction to a medication in the past, you should talk to your doctor about your response. Sometimes a prescription might be in the same family of drugs that caused your allergic reaction. Other times, it may be a drug that has a very low incidence of allergic reaction. Either way, it is a good idea to know how common allergic reactions are. Keep in mind, allergic reactions to medications often require the use of antihistamines and steroids to control your body's response. They may even result in a trip to the emergency room. What's more, they require you to switch to a new medication which can delay your treatment. Knowing your risk of allergic reaction can save a lot headaches down the road. Before you agree to taking any medication, it is important to know what you can expect from the drug. In other words, will this drug cure your condition or just treat the symptoms? It is also is important to know what exactly the drug does to help your condition. For instance, some medications for type 2 diabetes will lower blood sugar but do nothing to prevent heart disease which is the number one killer of people with the condition. Understanding how effective the drug is, as well as knowing exactly what it will do, can go a long way in helping you decide if the drug is right for you. If you find the medication your doctor is prescribing isn't going to address what you want it to, explore other options with your physician. For How Long Do I Have to Take This Drug? It is always helpful to know if this is a drug your doctor anticipates you taking for the rest of your life. With chronic conditions, this may actually be the case. What's more, you may want to ask your doctor what the consequences are for long-term use. Meanwhile, there are some conditions like high cholesterol where a patient can make lifestyle changes and no longer need the medication. In other cases, like a sinus infection or mild depression, a patient may only need to take a drug for a set period of time. If you watch television, you probably have witnessed the steady stream of prescription drug advertisements that end with the statement “ask your doctor about XYZ medication.” As a result, many patients are doing just that. But there are some risks associated with that approach. Following the ad’s advice may get you the drug you want, but it may not necessarily be the best option for you. In fact, according to a study from Harvard Medical School, 20 percent of patients who requested a specific drug were written a prescription by their doctor. For instance, in the study, about 20 percent of patients who requested a strong narcotic like oxycodone were given the drug by their doctors, while patients who did not ask received it just 1 percent of the time. 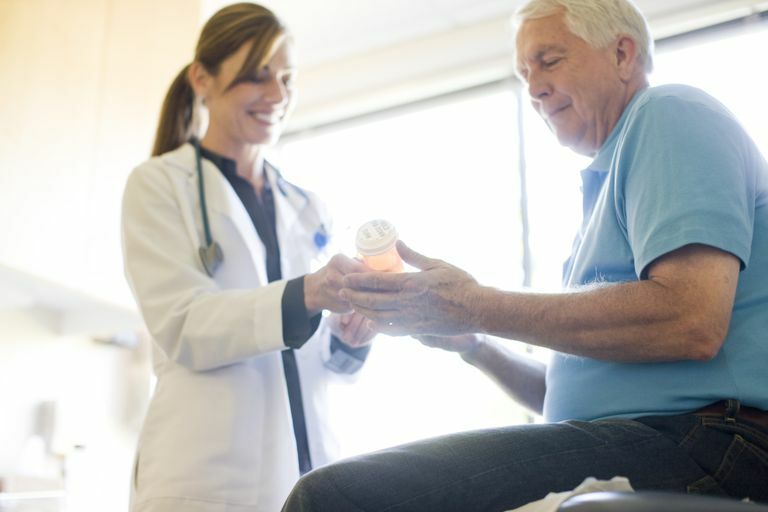 Meanwhile, for knee osteoarthritis sufferers, patients asking for Celebrex were prescribed the drug more than twice as often as those who didn’t ask for it by name. While there is nothing wrong with asking about a specific drug to treat your condition, especially if you have done a lot of research, it is better to ask your physician what he thinks about the drug instead. Having a conversation with your doctor about the drug maintains the partnership between patient and doctor. It also allows the opportunity to explore other options without making demands. If you think a different medication might improve your condition, talk to your doctor about it. Ask what the side effects might be as well as the risks and benefits. The ideal scenario is that you make the decision together.